For those of us lucky enough to live in the Waitakere Ranges with its awe-inspiring forests and thunderous coasts, communing with nature tends to be part of our everyday lives. The many ways in which we do relate to the natural world and its other inhabitants has always been a source of fascination for me. As a film-maker one often finds the best stories are on one’s own doorstep, in this case the activities of of local inhabitants, human and otherwise in our well loved local park, the Cascades Kauri Park in the Bethells valley. Recently I have initiated a film project with local volunteers & fellow Forest and Bird members in which we will be recording some of the activities taking place at the Ark in the Park located at the Cascades Kauri Park in Bethells Valley, near Auckland. 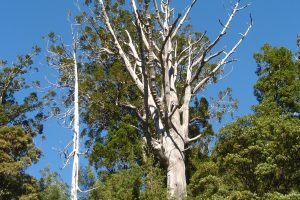 The Ark in the Park project is a joint project between Forest and Bird and the Auckland Regional Council to restore this vast stretch of kauri forest and bring back the birds that have disappeared from its branches. Native falcons, bellbirds, kokako and kiwi are just some of the birds that have been lost from this tract of forest. In the past few years, hihi and whitehead have been re-introduced into the park, and a transfer of kokako is expected to take place later this year. Our first filming mission was to the Pureora Forest in the Waikato on a joint robin catching trip with volunteers from the Puketi Forest Trust. Local iwi Ngati Rereahu entrusted 30 toutouwai/pitoitoi into our guardianship for release into the park, so over a period of two weeks, volunteers worked day and night to band and trap robin – not an easy task as you will see! We will be posting new video clips regularly so keep an eye out for them and let us know what you think. Jacqui Brooks has contributed 2 entries to our website, so far. View entries by Jacqui Brooks. Absolutely captivating to see the catching and banding of the little robins. Hopefully they will play important parts in the robin renaissance at Puketi and Ark in the Park. Is the catching of birds only done at certain times of the year, like not during the breeding season? I’d be worried about possibly catching and taking away a mother bird out getting food for her offspring. The videos were really great to watch, by the way. The catching and release is all done by permit from DOC, and following the best knowledge there is about the species and how to make the transfer as little stressful as possible. And, yes, it can only be done in certain times of the year – so as to not take the chance of taking a bird that already is nesting or looking after chicks. When they arrive in their “new” area they are first given fresh water and food before being released out of the traveling boxes. And the release has to be early enough in the day that the birds have a few hours to get settled before nightfall. If you have a chance to go out to the Ark site you will likely see some of the new birds – some of them hang out close to some of the tracks. .